For the first time in my short 25 years, I did not put up Christmas lights. Our little Norfolk pine is as naked as the day it first sprouted. There are no garland-laced IKEA bookshelves nor a scrap of lurking mistletoe. Scandinavian Christmas items at least accent our kitchen table as “A’s” mother helped boost sagging spirits. Very few Christmas-themed blog posts start out on a dour note, but this is my blog and it’s within my rights to ramble about my feelings, dammit! If we’re going to really get to talking about feelings, I’m not sure how I feel about Christmas this year. Yes, I’m excited, but not for the actual act of Christmas. I’m excited to see my family for one full, rare week. Presents? Eh. Giving them is what gets me going but all I “want” to receive are a few nice necessities that I can’t afford to buy all at once. But feeling this way about Christmas fills me with guilt. I’m usually forcing Christmas music and movies down “A’s” throat; but this year even I have to find a small stash of motivation just to press play. To put the nonexistent star atop the pine-like tree, there is apparently a national goat butter shortage. Not only have I stalked every grocery store in Madison, I've called every local goat farm to see if butter is something they do (obviously, it's not). I’ve had time to deal with the tragedy over the past month, but as butter is the main ingredient in cookies 99.9% of the time, I cant even make my usual mountain of treats! Maybe that’s at the root of my bah humbug? Who knows. But I do know I need to get into the Christmas spirt, and about five minutes ago. To find the spirit of Christmas past, I had to go basic. Feelings of warmth, love and chocolate. With a seasonal flavor thrown in for good measure. 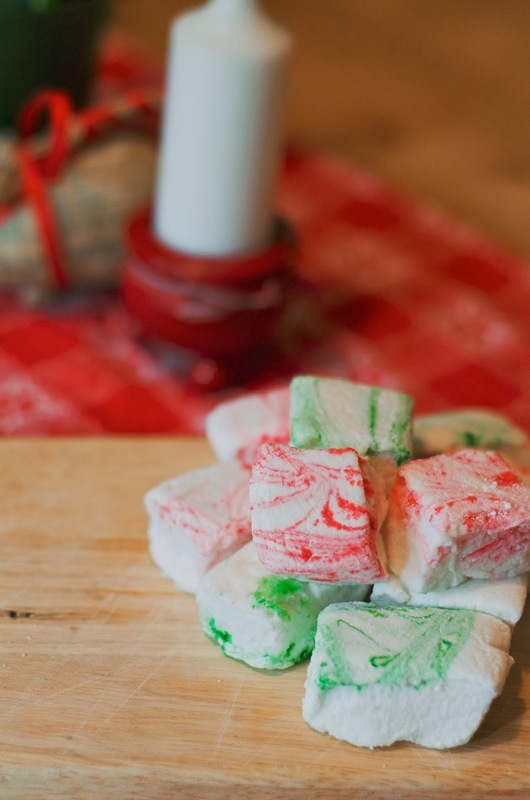 Santa Claus wrote me a prescription and it’s for homemade peppermint marshmallows, folks! 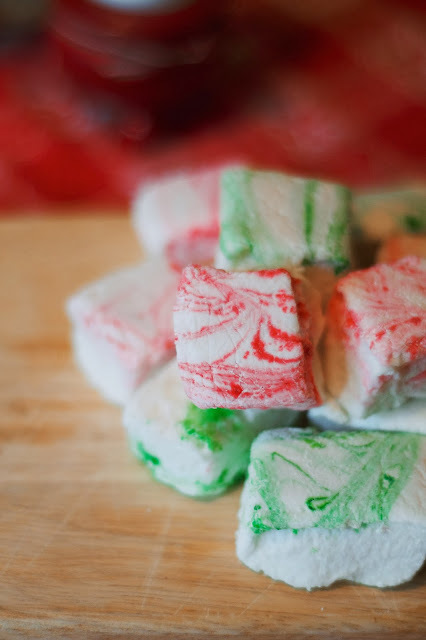 I can feel the Christmas creeping back in to my grinch sized heart and dreams of marshmallow faeries filling my head. Doggonit! This did the trick - I’m CURED! Watch out though, to keep my spirits high, I may have the plow through some of these darlings daily from now until next Wednesday! Pour ½ cup of the water into the bowl of a stand mixer with whisk attachment and sprinkle gelatin over the surface; set aside. In a small saucepan combine the remaining ½ cup water, granulated sugar, corn syrup and salt. Over medium high heat and with a candy thermometer attached to the side of the pan, cook the mixture until it reaches 240 degrees F. Immediately remove the pan from the heat once temperature is reached. Turn the mixer on low speed and, while running, slowly pour the sugar syrup down the side of the bowl into the gelatin mixture. Once all the syrup has been added, increase the speed to high and continue to whip until the mixture becomes very thick and is lukewarm, approximately 12 to 15 minutes. 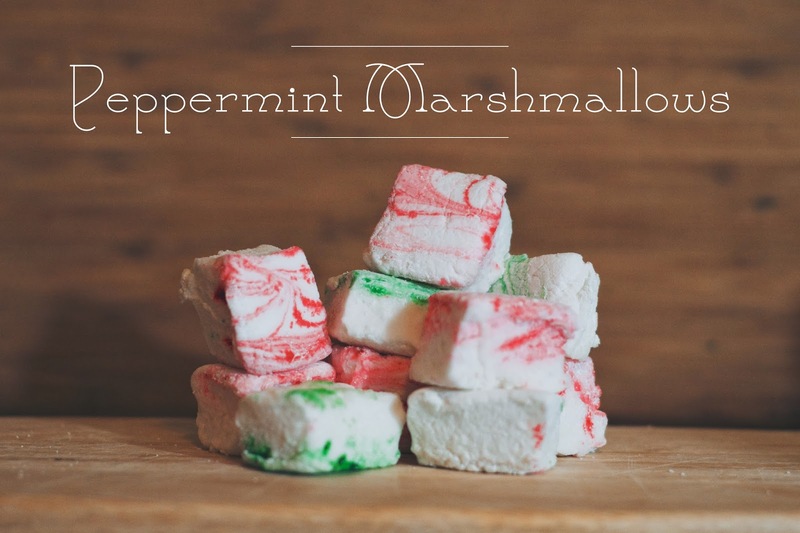 Add the peppermint extract during the last minute of whipping, starting with the smaller amount and increasing according to taste and desired strength. Sift together the confectioners’ sugar and cornstarch in a small bowl. Using a paper towel, spread the oil on the pans until it is well coated. Add the sugar and cornstarch mixture and move around to completely coat the bottom and sides of the pan. Return the remaining mixture to the bowl for later use (I had to mix up a bit more as my marshmallows were on the stickier side). Pour the lukewarm mixture into the prepared pan, using a lightly oiled spatula for spreading evenly into the pan. 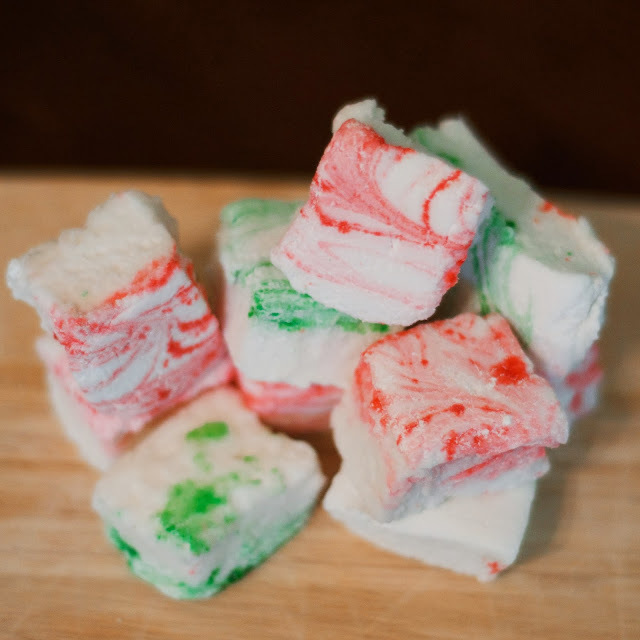 Drop about 6 drops of food coloring around the surface of the marshmallows and use a toothpick or knife to swirl the red into the marshmallows. Dust the top with remaining sugar and cornstarch mixture to lightly cover. Reserve the rest for later. Allow the marshmallows to sit uncovered for about 24 hours. Turn the marshmallows out onto a cutting board and use oiled scissors to cut into desired shapes. Once cut, dredge the marshmallows with the remaining powdered sugar/corn starch mixture. Shake the marshmallows in a fine mesh sieve to remove excess clumps. i'd love these in a cup of cocoa!